Paeonia Nick Shaylor has huge pastel pink flowers and blooms in a remarkable way. The flowers will slowly but surely turn from light pink to an almost pure white. Since this peony variety has a vase life of about ten days, you’re practically enjoying a fresh vase of flowers for over a week! Because of its large flowers, Nick Shaylor stands out well in larger rooms, making it popular peony for large-scale events like weddings. 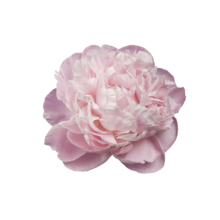 Nick Shaylor is a double-flowered peony that blooms in the shape of a rose. The pale pink, pastel-like colour will lighten during the blooming process. This peony variety was bred by Allison in 1931 and quickly made a name for itself, especially in the United States. It has been awarded twice with the prestigious APS Gold Medal, both in 1941 and in 1972. Nick Shaylor opens easily and has large, lush flowers. When it’s fully bloomed, this peony can turn a bit top-heavy. We recommend using a vase that can provide adequate support.